Field hockey is a popular sport for men and women in many countries around the world. Its official name and the one by which it is usually known is simply hockey. However in some countries and in some encyclopedic references by way of distinguishing it from other sports with the same name it is formally known as Field hockey. The sport of field hockey has a rich tradition that dates back to ancient times. When 4,000-year-old drawings were found at the grave of Beni-Hasen in the Nile Valley, it gave valuable information to the sport of just how long people have been playing the game. As time progressed, variations of the sport were played by the Greeks, Ethopians, Aztecs, and Romans. There were various hockey-like games throughout Europe during the Middle Ages, like hurling, and the word 'hockey' was recorded in the Galway Statutes of 1527. The modern game of hockey grew from the game played in English public schools in the early nineteenth century. The first club was created in 1849 at Blackheath in south-east London, but the modern rules grew out of a version of hockey played by members of Middlesex cricket clubs for winter sport. When the British Army started introducing the sport in India, the popularity and awareness of the game grew and the first clubs formed in Calcutta in 1885. The Beighton Cup and the Aga Khan tournament commenced within ten years. Entering the Olympic Games in 1928, India won all five of its games without conceding a goal and went on to win from 1932 until 1956 and then in 1964 and 1980. Pakistan won in 1960, 1968 and 1984. The first international field hockey match took place in 1895 (Ireland 3, Wales 0); the International Rules Board was founded in 1900. Hockey was played at the Summer Olympics in 1908 and 1920, but was dropped in 1924, leading to the foundation of the Fédération Internationale de Hockey sur Gazon (FIH) as the international governing body. Under FIH's direction led by seven continental European nations, the sport of field hockey was reinstated in 1928. Men's hockey united under the FIH in 1970. The two oldest trophies in world hockey are the Irish Senior Cup, for which 1st XI teams compete, and the Irish Junior Cup, for which only 2nd string sides can compete. While many countries had already embraced the sport, the United States didn't get involved in the sport officially until 1928 when the first official match took place against the Westchester Hockey Club and the Germantown Cricket club. Later in the same year the Field Hockey Association of America (FHAA) was born, becoming the 14th country to be involved in the FIH. Henry Greer, the founder for men's hockey in the United States was the president of the FHAA for 29 years, and also was a player coach for the 1932 Olympic squad. U.S. field hockey continued to compete in the Olympic Games in 1936, 1948, 1956, and 1996. When Women first became interested in playing the sport, field hockey was considered to dangerous for female competition. However as time progressed, more and more women became interested in the sport of field hockey and in 1887 the first women's hockey club, the Molesey Ladies Hockey Club, appeared in East Mosley, England. The first national association was the Irish Ladies Hockey Union in 1894, and though rebuffed by the Hockey Association, women's hockey grew rapidly around the world. The International Federation of Women's Hockey Associations (IFWHA) formed in 1927, about 40 years after women's play began. The association was organized and founded by women, and continued to grow in membership as time progressed. The IFWHA held conferences every four years, with the first taking place in 1930 in Geneva. Tournaments associated with these conferences were the primary IFWHA competitions. These tournaments were non-competitive until 1975. By the early 1970s there were 22 associations with women's sections in the FIH and 36 associations in the IFWHA. Discussions were started about a common rule book. The FIH introduced competitive tournaments in 1974, forcing the acceptance of the principle of competitive hockey by the IFWHA in 1973. It took until [1982 for the two bodies to merge, but this allowed the introduction of women's hockey to the Olympic games from 1980 where, as in the men's game, the Netherlands, Germany, and Australia have been consistently strong. Argentina has also emerged as a team to be reckoned with since 2000, winning medals at the last two Olympics, and the World Championship in 2002. The game is played between two teams of eleven players on a 91.40 m × 55 m (100 × 60 yard) rectangular field. The longer lines are considered the sidelines, with the shorter known as the goal lines. The field is divided at the center by a solid center line, dividing the field into two equal parts. 25 yards from each goal are dotted lines that along with the center line mark the field into quarters. At each end there is a goal 2.14 m (7 feet) high and 3.66m (12 feet) wide, and an approximately semi-circular area 14.63 m (16 yards) from the goal known as the shooting circle (or D or arc), bounded by a solid line, with a dotted line 5m (5 yards 5.6 inches–this marking was not established until after metric conversion) from that, as well as lines across the field 22.90 m (25 yards) from each end-line and in the center of the field. 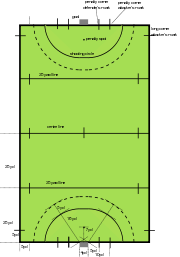 A spot, called the penalty spot or stroke mark, is placed 6.40 m (7 yards) from the center of each goal. The goal consists of two perpendicular posts four yards apart, and seven feet from the ground. The front of the goal posts touch the outer edge of the goal line, but can not extend beyond the crossbar nor the crossbar beyond the goal posts. 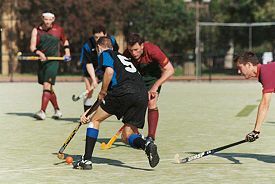 Traditional grass pitches are far less common in modern hockey with most hockey being played on synthetic surfaces. Since the 1970s sand based pitches were favored as they dramatically speed up the pace of the game. However, in recent years there has been a massive increase in the number of 'water based' artificial turfs. Water based astro turfs enable the ball to be transferred more quickly than on the original sand based surfaces and it is this characteristic that has made them the surface of choice for international and national league competitions. Water based surfaces are also less abrasive than the sand based variety and hence reduce the level of injury to players when they come into contact with the surface. The FIH are now proposing that new surfaces being laid should be of a hybrid variety which require less watering. This is due to the negative ecological effects of the high water requirements of water based astros. The game of field hockey is divided into two halves, ranging from 25 to 35 minutes a half depending on skill level. If the game is tied after both halves are complete, then usually a 10-minute sudden death overtime period exist; 7 players play instead of 11 to create more scoring opportunities. If the game is still tied after the overtime, then a shootout is used with five players from each side having a chance to score on the goalie. The game is started with a center pass, or a shot by the midfielder into play. This method to begin play is also used at the end of halftime, and after goals scored. Defenders must be five yards away from the ball when a center pass is conducted. Teams consist of eleven players on the field, and up to five substitutes. Substitutions are not limited but may not be made during a penalty corner. There are no set positions (even a goalkeeper is not required under the 2007 rules), but most teams arrange themselves (in a similar way to football (soccer) teams) into fullbacks (defense), midfielders (halfback) and forwards (front line). Many teams include a single sweeper. The rules do not specify a minimum number of players for a match to take place, but most competitions have some local ruling on this, and seven players is a common minimum. One player from each team may be designated the goalkeeper. Goalkeepers must wear a suitable helmet with full face mask and are also permitted to wear protective padding, including large leg guards, kickers and gloves. Although goalkeepers may block or deflect the ball with any part of their bodies, and propel the ball with their feet (and from 2007 any other part of their equipment in a "goal-saving action"), they must always carry a stick, and normal stick rules apply. Goalkeepers are permitted to play the ball outside their defensive circle (scoring area or "D"), but must only use the stick in this circumstance. Fully protected goalkeepers are prohibited from passing their side's defensive 23m line during play, unless they are taking a penalty stroke. For the purposes of the rules, all players on the team in possession of the ball are attackers, and those on the team without the ball are defenders. Field players may only play the ball with the face of the stick. Tackling is permitted as long as the tackler does not make contact with the attacker or his stick before playing the ball (contact after the tackle may also be penalized if the tackle was made from a position where contact was inevitable). Further, the player with the ball may not deliberately use his body to push a defender out of the way. Obstruction typically occurs in three circumstances–when a defender comes between the player with possession and the ball without first performing a legitimate tackle; when a defender's stick comes between the attacker's stick and the ball or makes contact with the attacker's stick; and also when (usually deliberately) blocking the opposition's passage to the ball (called third party obstruction). When the ball passes over the sidelines, it is returned to play with a sideline hit, taken by a member of the team whose players were not the last to touch the ball before crossing the sideline. If it crosses the backline after last touched by an attacker, a 15 m hit. A 15 m hit is also awarded for offenses committed by the attacking side within 15 m of the end of the pitch they are attacking. Free hits are awarded when offenses are committed outside the scoring circles. The ball may be hit or pushed once in any direction by the team against whom the offense was committed. However, the ball must not be judged to be intentionally raised by the umpire from a free hit, or the umpire can "reverse" the decision. This means that the team who were defending are now attacking, and can lead to swift counter attacks. Opponents must move 5 m from the ball when a free hit is awarded, and for attacking free hits within 5 m of the circle all attackers other than the one taking the hit must also be 5 m away. As mentioned above, a 15 m hit is awarded if an attacking player commits a foul forward of that line, or if the ball passes over the backline off an attacker. These hits are taken in line with where the foul was committed (taking a line parallel with the sideline between where the offence was committed, or the ball went out of play). If the attack commit a foul in the circle they are attacking, the defense additionally has the option to take the free hit anywhere in that circle. A long corner is awarded if the ball goes over the backline after last being touched by a defender. Long corners are played by the attacking team and involve a free hit on the sideline 5 m from the corner of the field closest to where the ball went out of play. In some areas these are also known as long hits. The short or penalty corner is a rather complicated set play that is awarded against a defending team when they commit any offense in their defensive circle (that is not penalized by a Penalty Stroke), and may be awarded when a deliberate offense is committed in the defending 23 m area, or when the defending team deliberately plays the ball over the back line. A group of four defenders and a goal keeper, wait on the backline for a short corner. Short corners begin with five defenders (including the keeper) arranged along the backline. All other defenders must return to the center line until the ball is in play. Attacking players begin the play standing outside the scoring circle, except for one attacker who starts the corner by playing the ball from a mark 10 m either side of the goal (the circle has a 14.63 m radius). This player puts the ball into play by pushing or hitting the ball to the other attackers outside the circle; the ball must pass outside the circle before the attackers attempt to get a shot or deflection into the goal. For safety reasons, the first shot of a penalty corner must not exceed 460mm high (the height of the "backboard" of the goal) at the point it crosses the goal line if it is hit. However, if the ball is deemed to below backboard height, the ball can be subsequently deflected above this height by another player (defender or attacker), providing that this deflection does not lead to danger. Note that the "Slap Hit" or "Slap" (a hitting motion, where the stick is kept on or close to the ground when hitting the ball) is classed as a hit for short corners, and so the first shot at goal must be below backboard height for this type of shot also. If the first shot at goal in a short corner situation is a push, flick or scoop, in particular the drag flick (which has become popular at international and national league standards), the shot is permitted to rise above the height of the backboard, as long as the shot is not deemed dangerous to the defenders on the line. This form of shooting is becoming more and more popular as international level players are able to get nearly as much power through the drag-flick as a full blown hit on goal. A penalty stroke (often referred to as a PS, a flick, or just as a stroke) is awarded when defenders commit a deliberate foul in the circle which deprives an attacker of possession or the opportunity to play the ball, when any breach prevents a probable goal, or if defenders repeatedly "break" or start to run from the backline before a penalty corner has started. This penalty pits a single attacker against the goalkeeper, and is taken from a spot 6.4 m out and directly in front of the goal. The goalkeeper must stand with heels on the goal line, and cannot move his feet until the ball is played, whilst the striker must start behind the ball and within playing distance of it (in other words he must be able to touch the ball with his stick). On the umpire's whistle, the striker may push or flick the ball at the goal, which the goalkeeper attempts to save. The attacker is not permitted to take more than one shot, to fake or dummy the shot, or to move towards or interfere with the goalkeeper once the shot is taken. Hitting or dragging the ball is also forbidden. If the shot is saved, play is restarted with a 15 m hit to the defenders; if a goal is scored, play is restarted in the normal way. If the goalkeeper commits a foul which prevents a goal being scored, a penalty goal may be awarded, for other fouls by defenders, the result is normally that the stroke is retaken. If the taker commits a foul, it is treated as if the stroke has been saved, and play recommences with a 15 m hit. If another attacker commits a foul, then if a goal is scored it is voided, and the stroke retaken. If the ball is raised off the ground in a manner that is, in the umpire's opinion, dangerous, the ball is turned over to the other team and they receive a free hit. The free hit is taken where the action that caused the danger occurred (that is, not where the danger itself occurs). The definition of a "dangerous ball" is a matter of interpretation by the umpires. Guidance in the rules states "a ball is considered dangerous when it causes legitimate evasive action by players"–but it also depends on the speed of the ball, the height to which it is raised, and the number of players near its path. It is, however, legal to raise the ball to make an aerial pass (the ball is flicked or scooped in the air, usually above head height), provided that the ball is both raised safely and brought down safely. The ball may only be lifted if the opposition players are further than 5m from the player raising the ball, and the ball is safely lifted above the players. Balls raised safely, but towards players of either side (usually below or about head height) are deemed dangerous. When receiving an aerial ball, the initial receiver (which ever side this player is on) must be given 5m to bring down the ball safely, before they can be challenged by an opposition player. If there are two or more players attempting to receive the ball (usually from opposite teams), and it is not clear which player was first to be in position to receive the ball, then a free hit is given to the defending team (the team that did not raise the ball). It is, however, legal to raise the ball when making a shot on goal (by hitting, flicking or scooping), but the shot must not be dangerous to any other players (for example, hitting the ball in the air towards goal with only the goalkeeper in the goal is safe–as the goalkeeper has protective padding, whereas hitting the ball in the air towards goal when there are a number of players between the striker and the goal can be classed as dangerous play). In general the ball may only deliberately be raised using a hit if the player is shooting at the goal. It is not dangerous to lift the ball over an opponent's stick (or body), provided that the opponent is not required to take evasive action. For example, a skillful attacker may lift the ball over a defenders stick and run past them, however if the attacker lifts the ball into/at the defender's body, this would be classed dangerous. Dangerous play rules also apply with relation to the usage of the stick. Players may not attempt to play at the ball above their shoulders (unless saving a goal). It will generally be considered dangerous play to hit the ball while it is in the air; the ball must be controlled first in this circumstance. A Green card is a warning. A Yellow card is a temporary suspension, just like in rugby football, normally for a minimum of 5 minutes duration without substitution. (In some modes, including indoor, shorter periods of suspension are applied, dependent on local rules). A Red card, just like in association football, is a permanent exclusion from the rest of the game, without substitution, and in many circumstances will also result in the player being banned for a certain period of time or number of matches (this is governed by local playing conditions, rather than the rules of hockey). Unlike football, a player may receive more than one green or yellow card. However they cannot receive the same card for the same offence (example two yellows for dangerous play), and the second must always be a more serious card. In the case of a second yellow card for a different breach of the rules, the temporary suspension would be expected to be of considerably longer duration than the first. However, local playing conditions may mandate that cards are awarded only progressively, and not allow any second awards. Umpires may also advance a free-hit by up to 10m for dissent or other misconduct after a penalty has been awarded; or, if the free-hit would have been in the attacking 23m area, upgrade the penalty to a penalty corner. The teams' object is to play the ball into their attacking circle and, from there, hit, push or flick the ball into the goal, scoring a point. The team with more goals after two 35-minute halves wins the game. The playing time may be shortened, particularly when younger players are involved, or for some tournament play. Conditions for breaking ties are not laid down in the rules of hockey, but many associations will follow the procedure laid down in FIH tournament regulations which mandate 7.5 minutes each way of "golden goal" or "sudden death" extra time (i.e., the game ends as soon as one team scores). If scores are still level, then the game will be decided with penalty strokes, in much the same way that association football penalty shoot outs are conducted. Other competitions may use alternative means of breaking a tie, for example, an extended period of golden goal extra time with a progressive reduction in the number of players each team can have on the field (usually termed "drop-offs"); if no goal is scored at the end of such extra time periods, again a result would be achieved using penalty strokes. There are sometimes minor variations in rules from competition to competition; for instance, the duration of matches is often varied for junior competitions, or for carnivals. Different national associations also have slightly differing rules on player equipment. In the United States, NCAA have their own rules for inter-collegiate competitions, and high school associations similarly play to different rules. This article assumes FIH rules unless otherwise stated. USA Field Hockey produces an annual summary of the differences. Each player carries a "stick," normally a little over 3 feet (90 centimeters) long and traditionally made of wood but now often made with fibreglass, kevlar and carbon fiber composites, with a rounded handle flattened on the left side and with a hook at the bottom. Metal may not be used in hockey sticks. It was recently discovered that increasing the depth of the face bow made it easier to get high speeds from the dragflick and made the stroke easier to execute. At first, after this feature was introduced, the Hockey Rules Board placed a limit of 50mm on the maximum depth of bow over the length of the stick but experience quickly demonstrated this to be excessive. New rules (2006) now limit this curve of the stick to 25mm so as to limit the power with which the ball can be flicked. The ball is hard and of plastic (sometimes over a cork core) and is often covered with indentations to reduce hydroplaning that can cause an inconsistent ball speed on wet surfaces. Many players wear mouth guards to protect teeth and gums from impacts from the ball or stick. Some local rules require their use such as US high school competition. In these competitions, from the 2006 season, no clear or white mouth guards will be allowed; they have to be colored, making it easier for umpires to confirm that the guards are being worn. Many players also wear shin guards, and again these may be required equipment in some areas. 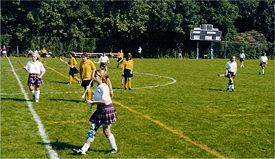 A few competitions, such as American high school competitions, require goggles (field hockey or lacrosse) to protect the eyes. A goalkeeper makes a glove save. Equipment worn here is typical gear for a goalkeeper. The 2007 rulebook has seen major changes regarding goalkeepers. A "fully-equipped goalkeeper" must wear a helmet, leg guards and kickers. Usually they wear extensive additional protective equipment including chest guards, padded shorts, heavily padded hand protectors, groin protectors, neck guards, arm guards, and like all players, must carry a stick. However, such a player may not cross the 23m line (although they may remove their helmet and take a penalty stroke at the other end of the field). However, if the goalkeeper elects to wear only a helmet (and a different colored shirt), they may cross the 23m line if they have removed their helmet (and placed it safely off the field of play). If play returns to the circle without them having opportunity to replace the helmet, this player still has "goalkeeping privileges," that is, they are not limited to using their stick to play the ball whilst it is in the circle. The helmet must be worn while defending penalty corners and penalty strokes. It is now also possible for teams to have a full eleven outfield players–and no goalkeeper at all. No player may wear a helmet or other goalkeeping equipment, nor will any player be able to play the ball other than with their stick. This may be used to offer a tactical advantage, or to allow for play to commence if no goalkeeper or kit is available. The main methods by which the ball is moved around the field by players are: the "dribble," where the player controls the ball with the stick and runs with the ball, pushing the ball along as they run; the "push," where the player uses their wrists to push at the ball; the "flick" or "scoop," similar to the push but with an additional wrist action to force the stick through at an angle and lift the ball off the ground; and the "hit," where a backlift is taken and contact with the ball is made quite forcefully. In order to produce a much stronger hit, usually for travel over long distances, the stick is raised higher and swung at the ball, sometimes known as a "drive." Tackles are made by placing the stick into the path of the ball. To increase the effectiveness of the tackle, players will often place the entire stick close to the ground horizontally, thus representing a wider barrier. To avoid the tackle, the ball carrier will either pass the ball to a teammate using any of the push, flick, or hit, or attempt to maneuver or "pull" the ball around the tackle, trying to deceive the tackler. When passing and maneuvering between players, certain commands are used to ensure understanding of movements and plays among teammates. Although these vary depending on the country in which the game is played, there are a few standard calls. By calling "through" or "straight" the ball is passed straight ahead to another player. "Flat" or "square" signifies a pass made to the right or left of the player with the ball at a 90 degree angle. Passes made backward are occasionally signified by a call of "drop." A hit made forward at an angle is recognized as "up" or "through." In recent years, the penalty corner has gained importance as a vital part of the game as a goal scoring opportunity. Particularly with the advent and popularization of the drag flick, penalty corners are highly sought after. Some tactics or set plays used involve the aforementioned drag flick, the straight hit, deflections towards goal, and various, more complex plays, using passes before shots at goal. At the highest level, hockey is a fast-moving, highly skilled sport, with players using fast moves with the stick, quick accurate passing, and hard hits, in attempts to keep possession and move the ball towards the goal. While physically tackling and otherwise obstructing players is not permitted, collisions are common, and the speed at which the ball travels along the ground (and sometimes through the air, which is legal if it is not judged dangerous by the umpire) requires the use of padded shin guards to prevent injury. Some of the tactics used resemble football (soccer), but with greater speed–the best players maneuver and score almost quicker than the eye can see. Formations provide structure to a hockey team on the pitch. They help players understand and share the defensive and attacking responsibilities. Although higher level teams may select from a wide range of formations, teams containing inexperienced players or teams which see frequent changes to their players are likely to select from a more limited range of formations such as 4-3-3, 5-3-2 and 4-4-2. (The numbers refer to the number of players arrayed across the pitch, starting in front of the goalkeeper with the defenders, then midfield and then attack.) The 2-3-5 formation, used predominantly in Australia from relatively lowly interschool to professional interstate competitions, provides common language for many players and helps explain why "center half" is often a name used for a player in the center of a defense with 4 or 5 players. Because hockey teams have 1 goalkeeper plus 10 outfield players as does association football (soccer), there are many common formations between the two sports. One important difference in modern hockey is the absence of an offside rule. This allows attackers (often a lone attacker) to play well up the pitch, stretching the opponents' defense and using the large spaces to be found there. To counter this, defenses usually keep a matching number of defenders near those attackers. This can frequently lead to formations such as 1-4-4-1 which is an adaptation of 5-4-1. The biggest two field hockey tournaments are undoubtedly the Olympic Games tournament, and the Hockey World Cup, which is also held every four years. In addition, there is the Champions Trophy held each year for the six top-ranked teams. Field hockey has also played been at the Commonwealth Games since 1998. Among the men, India has won 8 Olympic golds and Pakistan have lifted the World Cup four times. Amongst the women, Australia has three Olympic golds while the Netherlands has clinched the World Cup six times. Sultan Azlan Shah Hockey Tournament held annually in Malaysia is becoming a prominent Hockey Tournament where teams from around the world participate to win the cup. ↑ International Hockey Federation. Retrieved May 23, 2008. ↑ Official website of the Olympic movement. Retrieved May 23, 2008. ↑ World Hockey "Briefing for Umpires 2008." . Retrieved May 23, 2008. ↑ . US Field Hockey. Retrieved May 23, 2008. This page was last modified on 7 April 2017, at 19:52.